15. 8/4/2013 - Hattie's port-a-cath. We waited until the 6th to start chemo to give Hattie time to heal from the port-a-cath placement surgery. Hattie's port was placed completely under her skin. One end is a catheter connected to a vein and the other end is the bulbous port that rests under her skin on her chest. A needle is placed through the skin into the port, giving the medical team access to draw blood or deliver chemo directly into her bloodstream. You can place a numbing cream on top of the skin to reduce the pain of the needle accessing. The pictures here show the port with the dressings still on after surgery. 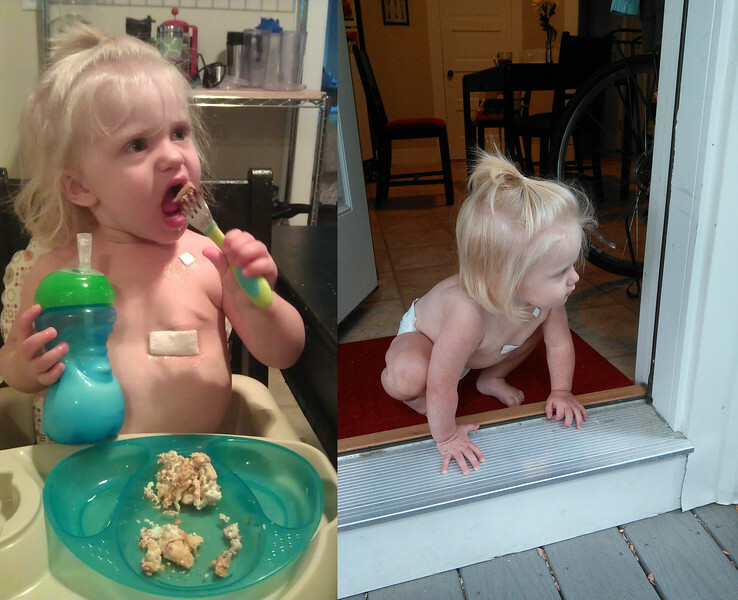 Hattie didn't complain about the dressings at all and had full range of motion, able to strike the Spider-Girl pose. The surgeon purposefully installed her port a bit low so the scar would one day be hidden in her breast fold. I never thought I'd be thinking about my little girl like that but appreciate the surgeon's foresight. Dealing with stuff like this in a medical manner will hopefully help awkward father-daughter conversations be slightly less awkward in the future.